I really enjoyed this – I loved the first two novels, and its one of those easy to read, fun series that you can just relax with. This time it’s Chloe who’s the main subject, put in a difficult position by Alpha werewolf Kieran. 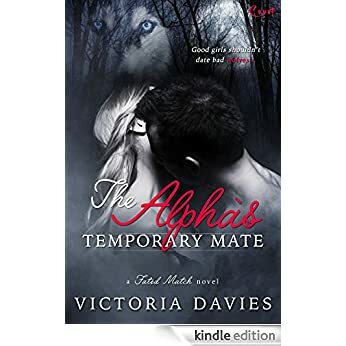 He wants a temporary girlfriend, one that will fool his pack and get them off his back about settling down. That’s something he’s not prepared to do. Chloe needs this to go right, he’s offering big money and if she can land him she’s promised the office managers job, as her boss will use his funds to open the next Fated Match. They don’t do temporary though, they’re all about finding Mates, but the money he’s offering persuades Chloe’s boss to do this as a one off, so long as the other person involved is clear its not permanent too. So far though all the people Chloe comes up with get rejected by him, while his wolf is telling him Chloe would be good. She reluctantly agrees to do it – its only a few weeks but involves living with him, and going on the annual pack retreat. She’s a witch, so that would be the perfect breakup reason for the pack, in fact it’s a win win – or is it? I love the way it played out, how we learned more about both Kieran and Chloe, how we met briefly the characters from earlier books, and how the friends on both sides needed them to be very convincing to pull it off. As Kieran says though she can’t flinch when he kisses her in public, so they need to practice…and that turns out to be the catalyst for much more emotion than either of them bargained for. Its a cute story, with some smouldering sensual scenes and some great humour. I did hope for a bit more jealousy from the pack females, who naturally would resent Chloe but what there was worked well. When it all fell apart I was so upset for Chloe – and I need that, need the sad bit. Its another good addition to the series, and one to read when you want a light novel to relax with and entertain you, not a deep dark drama that needs all your attention and concentration. There’s a place for both in my reading lists, it depends on my mood what I want to read. Stars: Five, a great addition to the series.